Buying a new TV is exciting because, more often than not, it means you can go a size up. When it comes to the World Cup, where you’ll likely have friends over or want to be totally immersed in the action, a bigger TV is going to be better. But can you go too big? Common sense can usually act as a rough guide to what TV will work in what room. If you’re eyeing up a 75-inch for your box room then be prepared to say goodbye to those eyes. Or if you’re thinking a 32-inch is far more civilised for your massive living room, you might as well stick to watching on your phone. But beyond common sense there is actually a science to all this screen size lark. In fact, there is a perfect recommended size to suit your lounge. Now that 4K UHD is here that has changed. 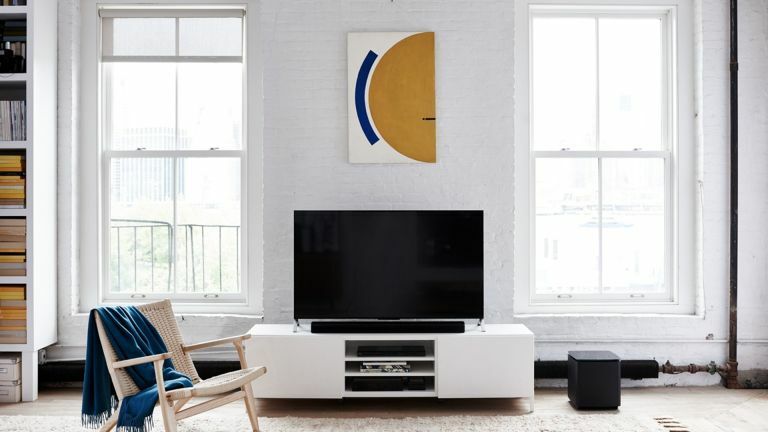 Here’s what you need to know to choose the right TV size for your room. What’s the ideal way to watch TV? This is a good question that helps you judge what size of TV you need based on where you’re going to sit in your room. It essentially comes down to one smart bit of maths which works out the ideal viewing angle. The human eye has about a 135 degree field of horizontal view. But to feel properly immersed in a display you need to take up only a certain chunk of that. Too much and you can have eye strain trying to see any peripheral action, too little and you feel distant and distracted by other things in your field of view. According to THX the recommended viewing angle for a cinema experience is 40 degrees, but 30 degrees is the recommendation for at home. To find this you can work it out based on how far your are from the TV and that screen’s size. What’s the right distance to watch TV from? Here’s a handy explanation of distance to screen size ratios which results in the right viewing angles for you. For a 55-inch TV you need to be between 2.28m and 1.68m to get between 30 and 40 degrees. Go larger to a 65-inch screen and you need to be between 2.69m and 1.98m for between 30 and 40 degrees. Go even bigger to 75-inches and you need between 3.1m and 2.29m for the angles. But drop down to a 40-inch and your distances are between 1.66m and 1.22m for those same fields of view. As you probably worked out, as you go larger you need to be further away, and smaller, closer. So in many cases it’ll be simple to pick the right size of TV as your lounge will probably already be laid out so all you need to do is measure up and splash out. Why does 4K UHD help? Thanks to the latest TV resolution, 4K UHD televisions are now viewable from much closer. As a result we can enjoy the higher viewing angle, like in a cinema, since we can be closer to the screen without spotting pixels. If you sit very close to a Full HD 1080p TV you’ll quickly start to notice pixelation, due to what’s called angular resolution. Swap that out for a 4K UHD model and you’ll be able to sit that much closer without noticing a drop in quality. As a result we can have larger TVs in smaller rooms and not only still enjoy the resolution but also a larger viewing angle for a more immersive experience. What should I spend on my TV? Since TVs are now larger yet more affordable than ever, the price shouldn’t be a major concern when picking a size. If you are going for affordable then you can still have 4K but perhaps opt for LED over OLED, or go for a TV without HDR to save money. These options should help you go larger without costing you so much. Get a super sized 75-inch Hisesne H75N6800UK with 4K and HDR LCD for £1,499, or go for an OLED for better quality but at a smaller 55-inches for the same price with an LG OLED55B7V also with 4K and HDR.